Naturalized in California. Present in 6 counties according to Calflora. Also naturalized in Europe, northern Africa, the Azores, New Zealand, Hawaii and Fiji. Naturalized in California. Present in 6 counties according to Calflora. Also naturalized in Europe, northern Africa, the Azores, New Zealand, Hawaii and Fiji. Occurs in climates which match California in Europe. Paspalum vaginatum is known from warm temperate, tropical, and subtropical regions around the world, and is widely regarded as an invasive species; In southern California, rapidly expanding populations and the formation of dense monocultures of P. vaginatum pose a serious threat to the structure, function, and native species composition of estuarine wetlands. In the coastal lowland wetlands of the Hawaiian Islands, P. vaginatum is highly invasive in brackish wetlands (Riefner 2010). Riefner, R. E., Denham S. S., & J Columbus T. (2010). Paspalum Pubiflorum and P-Quadrifarium (poaceae) New to California, with a Key and Notes on Invasive Species. Journal of the Botanical Research Institute of Texas. 4, 761–770. P. vaginatum is invading estuarine and other saline wetlands in southern California (Riefner 2010). In the coastal lowland wetlands of the Hawaiian Islands, P. vaginatum is highly invasive in brackish wetlands. It is also considered invasive in New Zealand and Spain, and it matches the California climate in Spain. P. urvillei invades and establishes in highly disturbed natural ecosystems where it grows in dense stands, displacing indigenous vegetation and altering the lower strata. It is listed as invasive in China, Japan, parts of Africa, United States, Puerto Rico and Australia (CABI Invasive Species Compendium). There are many points in GBIF, including areas of Australia with climate similar to California. While P. vaginatum is widespread, most of the recorded locations in GBIF do not match California's climate. In coastal habitats it can spread at 1-2 m per year and become dominant over native vegetation. In New Zealand it is of concern having invaded the nesting areas of the endangered New Zealand fairy tern (Sterna nereis), threatening a range of uncommon or endangered plant species, and possibly affecting fish breeding. It is also regarded as a threat to native vegetation in California (Riefner and Columbus 2008). Riefner, R. E., & Columbus T. J. (2008). 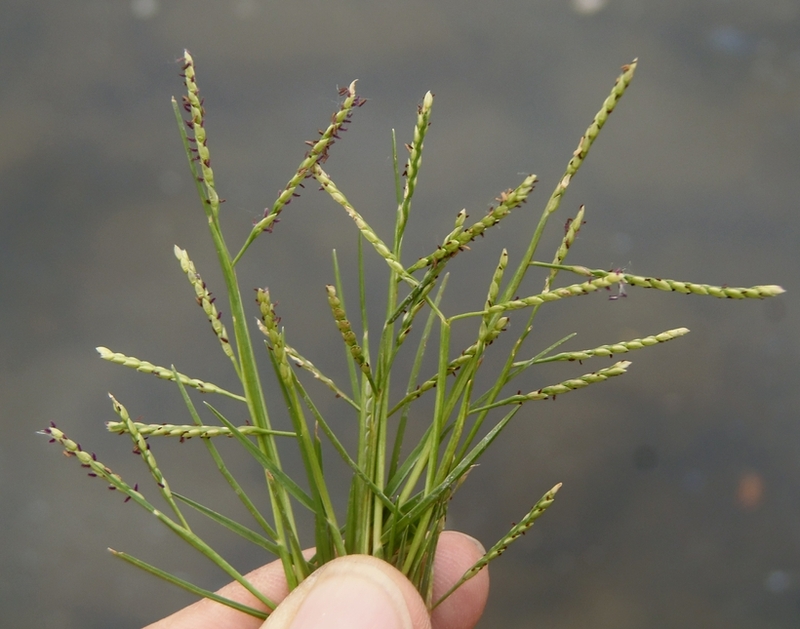 Paspalum vaginatum (Poaceae), a new threat to wetland diversity in southern California. Journal of the Botanical Research Institute of Texas. 2, 743–759. There is no information on whether P. vaginatum promotes or changes fire regimes. Since it is a small stature perennial grass of coastal wetlands it is not likely to promote fire. Since plants are only 10-50 cm tall they are unlikely to produce impenetrable thickets or block movement. It is established vegetatively using sod, containerized material, stolons, and rhizomes. Shadow, A. R. (2008). SEASHORE PASPALUM Panicum vaginatum Sw. Plant Fact Sheet. It is established vegetatively using sod, containerized material, stolons, and rhizomes. Short rhizomes and elongated stolons are apparently the primary mechanisms for expanding stands of seashore paspalum (Lonard 2015). Lonard, R. I., Judd F. W., & Stalter R. (2014). Biological Flora of Coastal Dunes and Wetlands: Paspalum vaginatum Sw.. Journal of Coastal Research. 31, 213–223. Seashore paspalum naturally produces some seed, but it has some dormancy and viability is low. Shin, J. S., Raymer P., & Kim W. (2006). Environmental factors influencing germination in seeded seashore paspalum. Hortscience. 41, 1330–1331. Seashore paspalum produces seed, but they are rarely viable. In a study of a seeded Paspalum vaginatum cultivar, seed germination was improved to 80% using different combinations of light and temperature. Without special treatments the germination of the seed lot used was 5%. This germination information, however, is not likely to apply to wild plants, unless the seeded cultivar escapes into the wild. Although seed viability is low, when it is produced it would likely occur within 3 years of clonal establishment. P. vaginatum Flowers and fruits from June to September. Outside of cultivation, vegetative reproduction of P. vaginatum would be possible through animal grazing and other natural physical regimes that would disturb and transport rhizomes and stolons. Paspalum vaginatum is apparently dispersed primarily by water when pieces of stolon or rhizome are carried often long distances by streams. These vegetative fragments root easily, forming new plants that start new infestations. P. vaginatum may have been spread vegetatively by animals, carried by mechanized landscape equipment to new sites, or rhizome and stolon fragments may have been dispersed by water during storm events from turf plantings in the uplands into urban drainages and then downstream to native wetland communities.